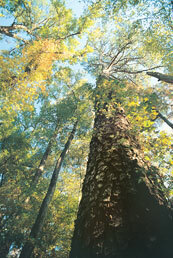 Just one hour from the bustling hub of Columbia, Congaree Bluffs Heritage Preserve offers an array of unique opportunities for hikers, bird- and wildlife-watchers, anglers, schools and other educational groups, and seekers of quiet and solitude. 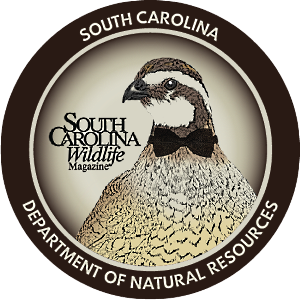 The 201-acre Calhoun County property, acquired by the S.C. Department of Natural Resources in 2001, contains three distinct types of habitat: bottomland hardwood forest, ravines featuring mixed hardwood forest, and upland planted-pine forest. First-time visitors to the preserve will want to explore a bit of all three types of habitat by walking portions of each of the three easy-to-moderate, looping trails, so plan your schedule accordingly. 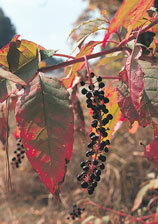 To get to Congaree Bluffs Heritage Preserve, take Exit 125 from I-26, then turn right onto Old Sandy Run Road. Drive two miles on Old Sandy Run Road until you come to a stop sign at the intersection with US Highway 176. Turn right onto US Highway 176 and travel 7.6 miles. Turn left onto Old Bellville Road just after you pass West Bethel Church and continue on Old Bellville Road for seven miles. Turn left onto Purple Martin Road just past Mount Carmel Baptist Church, and continue on Purple Martin Road until you come to a stop sign at Fort Motte Road. Turn left onto Fort Motte Road and travel 2.8 miles. Keep your eyes peeled for the brown Congaree Bluffs Heritage Preserve sign on the right side of the road. When you reach that sign, a dirt road called Turkey Track Lane will be on your left. Take that left to enter Congaree Bluffs Heritage Preserve. 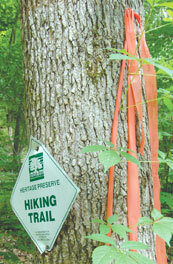 Before you set out, print out detailed directions and an easy-to-read trail map from the DNR's Web site, www.dnr.sc.gov. Just click on "Managed Lands," then select "Heritage Preserves" from the drop-down window labeled "Connect to type," and scroll down to choose Congaree Bluffs Heritage Preserve from the list. This Web page also lists interesting information about the preserve and contact information for folks who have questions or want to make an appointment for their group to visit the education center. You will not need much gear beyond the basics for this trip. Layers of clothing, comfortable walking shoes that will provide good traction on potentially muddy lowland trails, plenty of drinking water, a hat, camera, binoculars and a walking stick should be about all you'll need to enjoy the preserve in late fall and early winter. Congaree Bluffs also features a cozy picnic shelter, so consider packing a lunch and making a day of it. To get to the observation deck from the second parking lot, you have a few options. You may choose to cross over the dirt road and take the Bluff-River Walk trail, which winds down through the beautiful bottomland hardwood forest teeming with birds and other wildlife, to the Congaree River and the base of the sheer, rocky Congaree River bluffs for which the preserve is named. Take a moment to pause at the base of the bluffs. Look straight up and take in their height, examine the cold, grey stone and try to imagine what amazing things they have witnessed standing guard over the river. Take the left fork, and the short trail winds around bringing you to a steep incline that will take you up to the observation deck overlooking the bluffs. 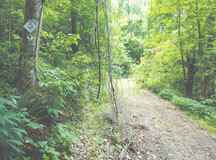 To get to the observation deck from the second parking area, you may opt to follow the dirt road past the locked gate, across an open field and to the deck. This path is not quite as scenic as the Bluff-River Walk, but it will give you an excellent sense of the lay of the land. As you walk along the road through the field in November and December, you will see a stand of planted loblolly pine to the left. This stand will be harvested and re-planted in longleaf pine in early 2008, restoring an even greater diversity of plant and wildlife species to the property. Ahead, you face the mixed hardwoods that are characteristic of the ravines - hickories, American beeches, red, black and white oaks and black cherries are just a few. To your right, you approach the now leafless, but still beautifully mysterious bottomland hardwood forest where pawpaw, many types of lianas, persimmon, sweet gum and red mulberry thrive, along with many other water-loving plant species. The third route to the observation deck, the most circuitous, offers hikers a chance to explore a little bit of everything the preserve has to offer, from the upland pine forest to the ravines and a bird's-eye view of bottomland hardwoods from the deck. To follow this lovely, roundabout route, take the Ravine Walk from the second parking area, then follow the right-hand fork to hop on the Observation Walk, which, after a tour of the mixed hardwood forest and another right-hand turn, will bring you to the observation deck. Keep your trail map handy and you should have no trouble following the proper directions. Overlooking the meandering Congaree River and miles of pristine swamp and bottomlands that make up the Congaree National Park, the observation deck provides views you won't want to miss. In summer, you'll see a seemingly endless, rolling cloud of emerald leaves and glittering green-brown water, but in late fall and winter things look dramatically different. The hardwood trees that populate the vast bottomland forests lose their leaves to the seasonal chill, opening the canopy and allowing for prime bird-watching. Bird-watchers will likely spot Congaree winter residents such as red-bellied and red-cockaded woodpeckers, cedar waxwings, American robins and scores more. Some very lucky visitors might even catch a glimpse of a bald eagle soaring over the Congaree. The river, too, looks different this time of year. With no leafy greens to reflect as it flows, it takes on a blue-grey sheen, mirroring the vast, stainless-steel winter sky. To hike the full length of the longest trail, the 1.5-mile Ravine Walk, go back to the first parking area and set out from there. All of the preserve's three trails interconnect, so hikers can spend an entire day exploring different sections of each one or lingering on their favorite trail. Whatever trails you choose to explore, you're guaranteed to have a unique experience with each visit to Congaree Bluffs Heritage Preserve. Elizabeth Renedo, managing editor of South Carolina Wildlife magazine, thanks Heritage Preserve Manager Brett Moule for showing her around and providing so much fascinating information. For more information, call (803) 734-3886.